As a delivery truck accident attorney in Los Angeles, I know that L.A. has a heavy volume of trucks and cargo vans traversing our busy streets and freeways every day. They are ubiquitous in the City of Angels and provide a vital role in our economy. However, I also know first hand from both living in the city and representing victims of trucking accidents, that the drivers of these vehicles can sometimes be negligent and even reckless and cause accidents which result in injury or death. 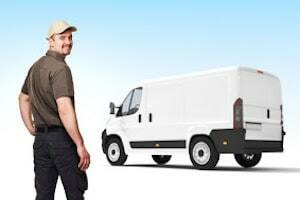 If you have been the victim of an accident in California that involved a delivery vehicle such as UPS, Federal Express, delivery trucks for large retail chains like Ralphs, Wal-Mart or Target Stores or any similar commercial vehicle, you deserve prompt and immediate compensation for your pain and suffering. This not only applies to any injuries that you may have received from the crash, but also to the mental stress you may have experienced due to the effects of your injuries. It also applies to any income you have lost as a result of having to miss work days due to being in the hospital, or at home recuperating after the incident. The legal doctrine of Respondeat Superior basically states that an employer is responsible for the actions that their employees commit during the time of their employment. In other words, if a person employed as a delivery truck driver in Los Angeles is involved in, or directly causes, a crash that results in injury to another person, the person who owns the company and the delivery truck is responsible – and can thus be cited and sued for due compensation. In an attempt to limit their liability, many commercial delivery carriers have gone to hiring "independent contractors" for delivery of packages or goods. For example, Federal Express trucks are often operated by separate legal entities (corporations or limited liability companies contracted with Fedex) to drive their trucks. Likewise, large retail delivery services like Amazon.com contract with separate companies to deliver parcels on their behalf. Tracking down these entities, sorting out the liability issues and finding the proper defendants against whom legal action may be taken can be very complicated. If you have been involved in, or injured by, a delivery truck accident in Los Angeles that was caused by the negligent act of any of their agents or employees, it is an excellent idea to contact a qualified attorney immediately. Having your case represented by a qualified legal representation is your best course of action. Don’t wait until the case is cold to file your claim. If you are suffering injuries from the result of a crash caused by another person’s negligence or oversight, the time to claim the due compensation you deserve is now. A lawyer who specializes in such cases can help you get a favorable settlement that will compensate you fairly for your suffering. There is no time like the present to claim what is rightfully yours, so please contact a Los Angeles attorney today.